NEW YORK — Donald Trump launched a broad rebuke of his presidential rival Hillary Clinton Wednesday, accusing her of being “a world class liar” who personally profited from her tenure at the State Department. “She gets rich making you poor,” Trump said. 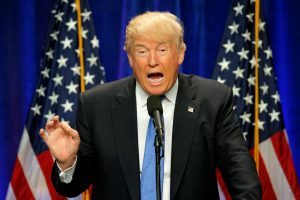 Seeking to steady his campaign after a difficult stretch, the presumptive Republican nominee cast himself as the White House candidate best positioned to address Americans’ economic interests. “This election will decide whether we’re ruled by the people or the politicians,” Trump said during an address at his hotel in New York’s SoHo neighborhood. He made his arguments in a pointed yet measured tone, less loud and strident than has been typical in most previous campaign speeches. The speech marked an opening salvo against Clinton, the presumptive Democratic presidential nominee, in the general election campaign. It came as the real estate mogul faced growing questions about his readiness not just for the presidency, but for the campaign he will need to run to get there. Trump made a direct appeal to supporters of Clinton’s primary rival Bernie Sanders, urging them to help him fix a “rigged system.” He also argued his trade and immigration policies would be more beneficial than Clinton’s for blacks and Hispanics, two groups that have overwhelmingly voted for Democrats in recent presidential elections. Still, the central goal of Trump’s speech appeared to be uniting the Republican Party and appealing to people who may be skeptical of him but vigorously oppose Clinton. He unleashed a grab bag of Republicans’ favorite criticisms of Clinton, including her use of a private email server while she was secretary of state, her response to the deadly 2012 attacks on Americans in Benghazi, Libya, and accusations that she and former President Bill Clinton profited from their family foundation. “Hillary Clinton may be the most corrupt person ever to seek the presidency,” Trump said. Trump also tried to turn Clinton’s strengths into negatives. He spent much of his speech trying to undercut her foreign policy record, highlighting her early support of the 2003 invasion of Iraq, which she now says was a mistake, and linking the policies she promoted at the State Department to the rise of the Islamic State terror group. “The Hillary Clinton foreign policy has cost America thousands of lives and trillions of dollars and trillions of dollars and unleashed ISIS across the world,” Trump said. Trump’s speech came on the heels of his firing Monday of campaign manager Corey Lewandowski, a controversial figure who was seen as an impediment to efforts to build out a more robust campaign organization. A new fundraising report released hours after Lewandowski’s firing underscored how much ground Trump has to make up: he started June with just $1.3 million in the bank. Trump allies cast Lewandowski’s firing this week as the start of a new phase for the campaign. Paul Manafort, the campaign chairman and Lewandowski’s internal rival, signaled on a conference call with aides that a rapid staffing expansion would be coming soon. Tennessee Republican Sen. Bob Corker, who has been seen as a potential vice presidential pick, said he was “pretty excited” to learn of the changes. “I think that what appears to be occurring over the last 24 hours is a movement in a direction that I think could be very, very positive,” Corker said.